All Grain Plus Extract Dunkelweizen homebrew recipe. 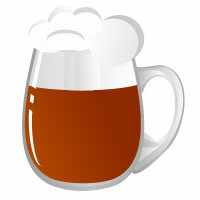 This homebrew recipe uses the following ingredients: Bavarian Wheat Extract Thomas Coopers, Dry Malt Extract - Wheat - US, Chocolate Malt - US, Roasted Barley - US, Hersbrucker Hops, Wyeast Weihenstephan Weizen 3068 Homebrew Yeast. Heat 2L Water to 65C and flame out. Add 90g Chocolate Malt and let cool to 35C. Add roasted barley steep for 30 minutes then strain. Boil the wort and add half the hops. Slow boil for 30 minutes and flame out. Add remaining hops and steep for 20 minutes. Chill to 17C. Strain into FV. Add the DME and the can of TC Bavarian Wheat Extract. Stir to dissolve completely. Top up to 8 liters. Brew at 22C.